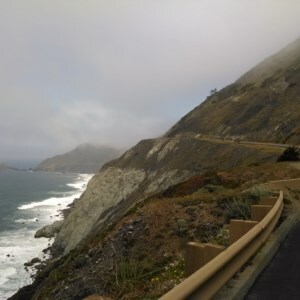 Devil's Slide was once a dangerous segment of Highway 1 (also known as Pacific Coast Highway) in California that has historically been a headache for motorists. During the rainy season, the soil under the road becomes saturated and unstable forcing Caltran to close the road. Today, that segment of Highway 1 (known as Devil's Slide) has been replaced by a tunnel known as Devil's Slide bypass tunnel and bridge. What remains of the original 1.5 mile stretch along the ocean has been repurposed as a multiuse pedestrian/cyclist route. At both ends of the 1.5 mile segment of the multi-purpose trail, there is a parking lot with sufficient spots. Close to the trailhead are 10-12 parking spots with an overflow lot closer to Highway 1. The multiuse trail itself is hilly and because it is near the coast can be windy and cold. So even though it is a short trail, remember to dress in layers. Since the opening of the trail is recent news, the paved trail, landscaping, and even bathroom facilities are all well maintained. The views are spectacular, most ocean facing views. Unfortunately, the hike itself was a bit of let down. The website at http://www.devilsslidecoast.org/recreation/ made it appear like there was 47 miles of trail. In reality, there was only 1.5 miles each direction of the freshly paved path. For me, that is barely a reason to make the drive to the trailhead. At either end, you can continue on other trails, which we did. There were several signs that marked the trail, and also said to continue at your own risk. The trail is located between Half Moon Bay and Pacifica along scenic Highway 1. The best site for information is http://www.devilsslidecoast.org/recreation/. Its worth a visit for casual hikers, but for those looking for a longer more challenging hike, look elsewhere.